Picking up a Robin Benway novel you know the experience is going to be a well-rounded satisfaction. There is something to be said about her style of writing that deserves more attention. Her words have the power to make you laugh, then pages later you find yourself in a puddle of tears. It's a very well balanced array of emotions, especially with this story. I appreciated Robin Benway's humor, yet keeping it very authentic to the story at just the right moment. Emmy & Oliver breaches a very serious topic such as child abduction, and delivers with the utmost respect. This emotional YA contemporary will tug at your heart, while filling it with pure joy. Emmy remembers the day Oliver was taken away by his father. She remembers the reporters who camped out on their street, always looking to capture the latest in this unsolved abduction. She remembers how Oliver's mom never stopped looking for him. Emmy remembers the fear she saw in her own parents eyes of one day losing their own child, too. It's ten years later, and seventeen year old Emmy finds out Oliver is coming home. He's been found. So much has happened, yet everything has stood still, for the past decade. The transition that Emmy must witness as Oliver is placed back into his mother's home is difficult to watch, yet so compelling to see unfold at the same time. As Emmy and Oliver are reunited, a memory of a seven year old Oliver for Emmy and no memory at all of Emmy for Oliver, they begin to rediscover a friendship that soon blossoms into something more. This novel transitions at just the right pace. I felt the struggles Emmy must go through as she realizes the tight hold her parents have on her life is not healthy. Living in fear can also hold us back from moving forward. I appreciated how Robin Benway took her time expressing this aspect of the story because it aided in building the relationship between Emmy and Oliver as well. In the end my heart breaks for Oliver, the boy who was robbed of his childhood and expected to readjust to a life he knows nothing about. But then my heart swells for the selfless love that Emmy gives, showing him the way to a possible future filled with trust and reassurance. 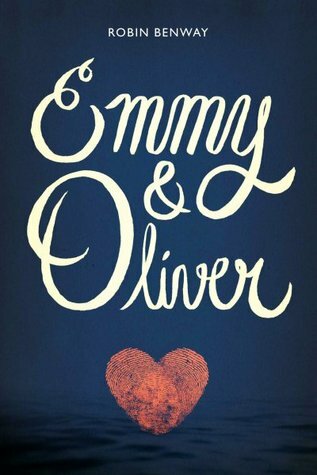 Emmy & Oliver is a touching, poignant novel from a talented, joyful writer. I cannot recommend this one enough. I loved Emmy & Oliver! I honestly can't get enough of the way Robin Benway writes (which means I should most definitely read Audrey, Wait! soon), and in this one, she balances humor and heartbreak so dang well. I enjoyed getting to know both Emmy and Oliver, and just got swept up in their story too. I loved this one, too! It was just right. It had the perfect amount of seriousness and humor and romance. MAN I can't wait to read this one! I adore Robin Benway something fierce!